Climate-related risks, both physical and transition risks, are increasingly felt in the financial sector. Physical risks for the financial sector arise as a result of increased damage and losses from natural phenomena whereas transition risks result from the transition to a low-carbon economy. The transition to a low carbon economy requires a significant reduction of greenhouse gas emissions, which possibly involves climate policy, technological developments or changing consumer preferences. However, a radical and abrupt transition to a low-carbon economy can expose the financial sector to substantial transition risks, such as potential write-downs of loans and investments in transition-sensitive sectors. Therefore, it is essential that financial institutions have a thorough understanding of the risks relevant to their balance sheets and take appropriate mitigating measures where necessary. One way of achieving this is to further develop and apply forward-looking risk management methods, such as climate transition stress tests. 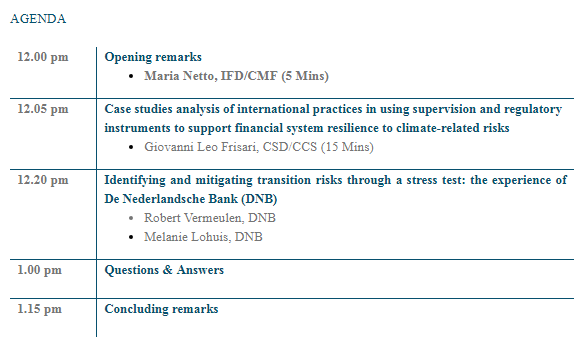 In this context, De Nederlandsche Bank (DNB) has worked on the implementation and further development of climate stress tests with the aim of addressing climate-related risks. 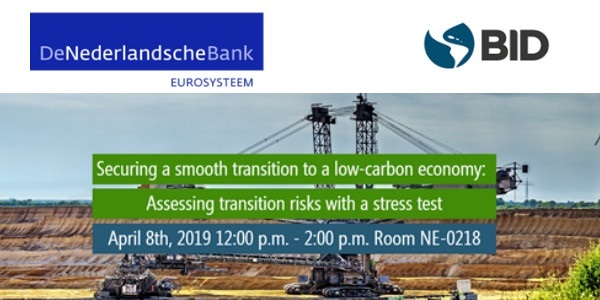 DNB recently conducted a stress test for transition risks, focused on the impact of an energy transition from a macroeconomic and macro-prudential perspective. For today’s BBL, DNB will share the results of the transition risks stress test.